Infusion sets – overlook them at your peril…! Infusion sets. The one part of a pump or artificial pancreas system that interfaces directly with the human, breaking the skin machine barrier. Infusion sets. 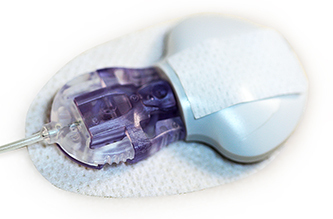 Small pieces of plastic or steel inserted through the skin, with the capacity to make or break your experience of using a pump. Yes, these little guys are important, and if you don’t get on with them, they can utterly destroy your ability to use some manufacturers pumps. I recently encountered my own issue with this, with the Roche Flexlink+ cannulas, which for some reason, just didn’t work for me. Dr Lutz Heinemann published an article in 2012 describing them as the “Achilles Heel” of pumping, and it should be required reading for anyone about to start on a pump, or HCPs in pump clinics. To sum it up, not all infusion sets are equal, and not all people react the same way to the same infusion set. The result? Significantly variable outcomes. So it’s perhaps shouldn’t come as too much of a surprise that there is some focus on these little critters in the diabetes technology world. 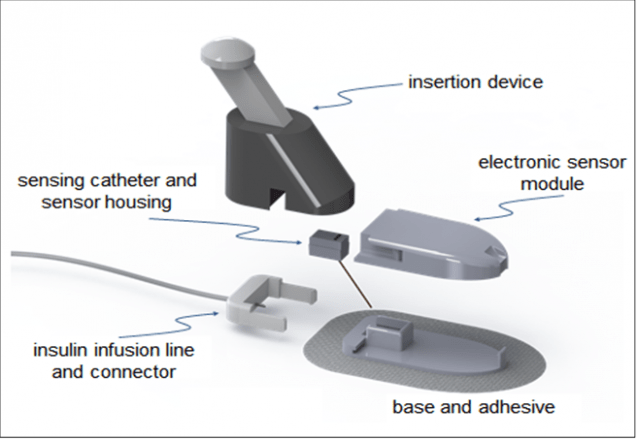 Here I’ll cover three areas of innovation in the infusion set world that potentially will make living with a pump (and therefore a closed loop) that little bit easier. In 2017, Unomedical undertook clinical trials on their “Lantern” infusion set, which is intended to allow for longer insertion periods. The data reported in an ADA poster suggested that while results were not overwhelming, further trials were needed. It’s worth noting that towards the end of the 7-day period, they observed that insulin action was reduced. The basis of this cannula being the splits in the teflon allowing infusion at the tip and further up. Seeing this design, it does raise the question of what the failure rate might be, and if there could be issues at removal. Back in 2014, Medtronic announced the not very successful Minimed Duo. It was a combined CGM sensor and infusion set, that needed changing every three days. Being a Medtronic product, it probably cost a small fortune. In 2016, they then submitted a patent for something similar, but completely new. The patent details are available here: https://patents.google.com/patent/US20170290512A1/en. It’s believed that this is called the “Duo”. This integrated solution combines multiple amperometric glucose sensing units with insulin delivery in a single unified device that is ideal for diabetes management. The challenges for anyone looking at a dual use cannula/sensor are the issues with the effects of insulin preservatives on sensors and secondly, the difficulties of allowing a combined infusion set and sensor to remain in the body for 7-10 days, as current CGM sensors are now able to. 3 days seems like a pricing challenge at the distribution layer. There doesn’t appear to have been a lot of information from PDT since 2017, although they are supposedly funded. 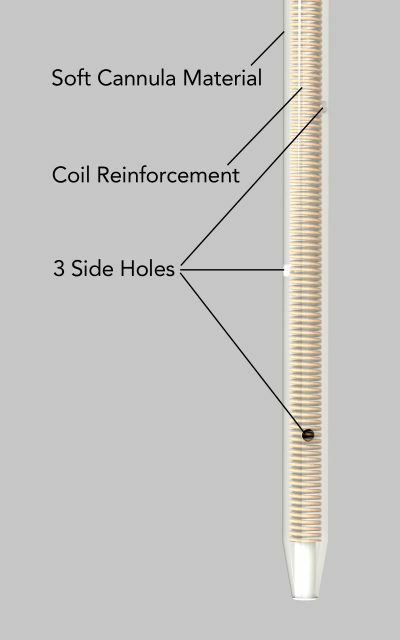 SteadiFlow Technology: the softer cannula material, coil reinforcement and 3 additional side holes work together to ensure you get the insulin you need. As anyone who follows cannulas (why sounds a little like an oxymoron in its own right) will tell you, the BD Flowsmart product that came to market with Medtronic a couple of years ago, failed due to regular kinking. 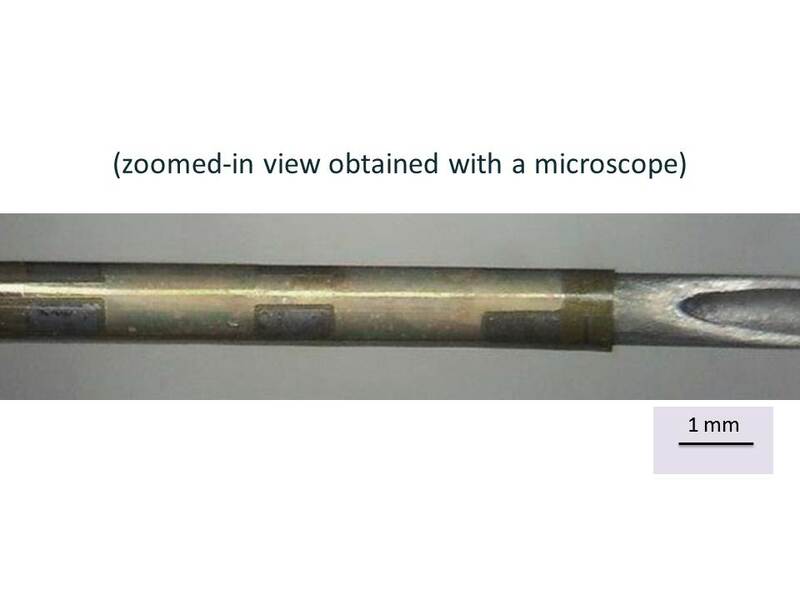 It had an extra hole on the side to improve insulin flow, but this introduced a structural weakness that caused instability. Capillary Biomedical have introduced a coil reinforcement into the cannula to stop it collapsing at the holes when inserted. These are currently investigational devices, but look to be very interesting in improving insulin absorption. All of these present some good news for those of us who use insulin pump therapy, and as the number of things you stick into yourself and the frequency of change drops, it should make very many more people happy! All of these examples show that various companies are working hard on, what is considered, by many, to be the weakest point in the pumping (and artificial pancreas) world. The physical connection to the human being. Hopefully, as these products come to market, they will make living with a pump a little easier and less prone to failure.